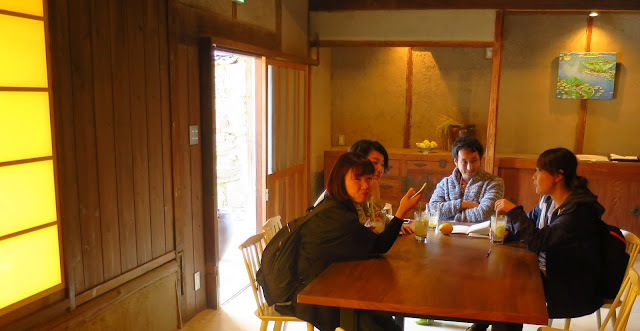 *An English Travel Writer*: Teshima, Part 2. So, we had already packed a day's experiences into half a day in Teshima, but there was more. The most famous artwork on the island is the Teshima Art Museum by Ryue Nishizawa and Rei Naito, and I definitely wanted to see that. It's not my idea of a museum really, but it is a most striking and zen-like place. Set on a terraced hillside overlooking the inland sea, it is approached by a woodland path. After removing your shoes you enter through a low white tunnel and find yourself inside a white, irregularly shaped dome, illuminated only by the light from the sky which enters the dimness through two large holes in the roof. You stay silent or speak only in whispers in the cathedral-like atmosphere. Do you see the people sitting silently below? Many of them were actually watching water oozing gently from the floor. The floor isn't level, so the drops of water emerge slowly from it and then run, apparently at random, to blend with other watr-drops to form tiny streams and gather into pools which eventually seep away. I think the idea is to help you think about life and our place in the universe, how we ourselves are just like drops of water which eventually join the great stream. Or, that's how I understood it, anyhow. I found it so absorbing that I could have stayed there for hours. We only actually stayed about half an hour, and to be honest, T was less enthusiastic than me. Having obediently removed his shoes, we both kept accidentally stepping in little puddles of water, and he didn't enjoy having cold, wet socks. Outside again, we dried the socks in the sun and noticed something was going on across the road, in a valley surrounded by very small, terraced fields. So we walked over, through strips of cosmos and other crops. I had absolutely no idea what was going on. Something was written on a blackboard in Japanese but it meant nothing to me, nor did I understand the purpose of all the balloons you can see in the film. On we wandered, with something unexpected, it seemed, around almost every corner. These two life sized dolls were standing in a farm barn together with what I suppose are bags of satsuma fertiliser. 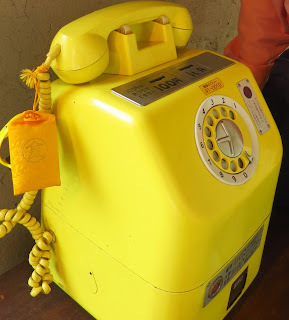 ... and even the phones are lemon yellow. To be honest, I didn't think the Lemon Hotel was up to the standard of the other art installations, or perhaps my brain had had as much art as it could handle that day. Anyhow, the shadows were lengthening, so we caught the bus back to the main stop, which was about a kilometre from Kurieshi's house, and walked back. We passed quite a collection of cats - must have been at least a dozen by the water. "Cat tourism" is a feature of some of the Seto Sea islands, and not a very popular one, because feral cats are often sick and some of the visitors who seek to feed them often trespass right into peoples' homes, I was told. But most of these cats had collars, which suggested that perhaps this was just a place where cats like to go to socialise - if cats do socialise. I never thought they particularly did, but on Teshima, who knows? Kurieshi's house was interesting. It was actually his old house - I think his grandma might have lived there. Anyway, he's built a new one across the courtyard for himself and lets out the old one on Airbnb. It is traditional Japanese style and boasts what is known as a goemon buro - a traditional stone bath, at least a hundred years old, lined with metal and originally heated from the bottom with a fire. 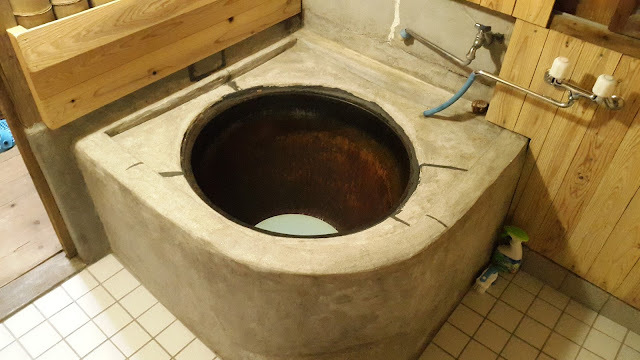 In my picture, you can see the loose circular white plate at the bottom that you crouch on to avoid getting burned by the fire below - but I'm glad to say that Kurieshi had converted the hot water to electricity so we didn't have to worry about that problem. 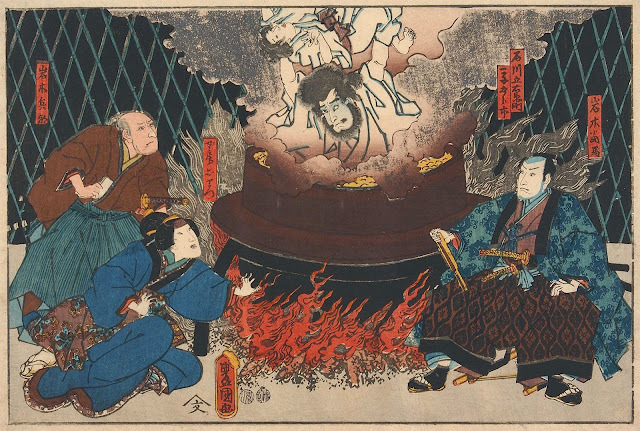 Goemon was a sort of Robin Hood character in old folklore. It's hard to know if he was really good or bad, but one good thing about him is that, when he was being boiled to death for his sins, he held his son (who'd also been put in the pot with him) above his head to protect him. Most Japanese people I spoke to about goemon buro remembered their parents or grandparents having one. Several people said that, as children, they were rather scared of it, and with that fire at the bottom, I'm not surprised. It was interesting to bathe in it, but I decided I preferred the modern sort of Japanese bath, which keeps the temperature at 42 degrees and tells you in a bright little voice when it's ready. 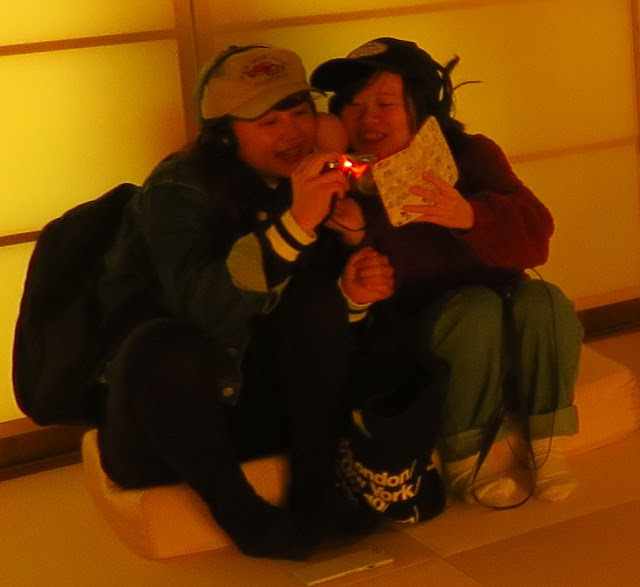 So we unrolled the futons, had a frugal supper, and a bath in the goemon buro, and that was our day on Teshima. We had to leave early next morning, and I know we didn't see half of what there was to see. I hope we can go back one day and see more of the art. Maybe by then, Kurieshi (who is nuts on all kind of vehicles) will have got his Mini Cooper roadworthy again. It would certainly be fun to see that neon welcome sign flashing for us at the port. 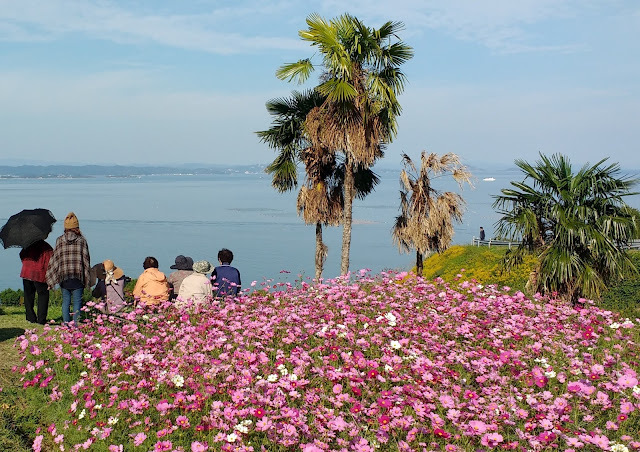 If you are interested in finding out more about the art islands yourself, by far the best resource I have found is David Billa's blog, "Setouchi Explorer." David is French, but married to a Japanese, and he also speaks perfect English. We had a very interesting meal together in Takamatsu, in which he told me so much about the background of these island art projects, both in Teshima and elsewhere. He has fired my wish to return. Thank you so much for the mention Jenny. Concerning the mysterious small event near the Teshima Art Museum, I have the answer. So before 2009, all the rice fields around the museum (built in 2010) were pretty much abandoned, and Benesse either bought them and / or made a deal with the landowners to have the fields restored so that the environment around the museum include rice fields (terraced rice fields are pretty rare in the area, they can only be found on that part of Teshima and one village on Shodoshima). The point being that nature is one of the main work of art "exhibited" in the Teshima Art Museum. So, since 2010, the rice fields have been used again, and every year on the last week-end of October or the first of November, the Koebi-tai volunteers, Teshima resident and whoever else feels like it harvest the rice from those fields. And it's the occasion for small celebrations, like the small concert you shot. And the harvested rice? It's for Teshima's population. I assume that most of it ends up in the plates of Shima Kitchen's costumers. On a side note, I think it's the first time I see a functioning goemon-buro. These photos take me out of my chair and send me traveling. Thanks. This sounds like a wonderful place and your Air B&B looks just right. (Smart on the bath!) I love the concept, though, of the Lemon hotel -- but then, I'm a sucker for lemons. And for orange cats, as you might imagine. In fact when we hosted our first Japanese guests I still had Stimpy who was orange and white, much like the cat in the photo and Shoko, my guest, called him a "Japanese cat." Apparently there are a lot of orange boys over there! It all looks fascinating and I'm really enjoying this series of posts on your Japan trip. What a marvelous place to visit and just looking at the pictures of the museum, I could feel the peace surrounding the visitors. I would have wanted to stay longer. Your heads must have been spinning with all the impressions of art and everyday sights and sounds! I like the white tunnel and dome and think I could spend hours there, too, although I don't like having cold and wet feet at all. Yellow is my favourite colour, so I really like the yellow telephone! This is fascinating - I love that museum!! Absolutely fascinating (but that's usual with your posts Jenny) and I would have thoroughly enjoyed the Teshima Art Museum. Were you allowed to remove both shoes and socks? I say that because I became very used to bare feet when I lived in New Zealand. However it was the rather unusually odd that caught my eye at the end of the post. Japan drives on the same side of the road as we do in the UK and so it seemed slightly odd that the Mini would seem to have been specially imported from a country which drives on the right. I don't think people would have been that keen on the idea of removing socks too, although that's just my impression, probably because I didn't see anyone with bare feet. The mini was a special one, driven by a very famous driver, apparently. Since I don't follow any kind of motor sport I didn't know who the driver was. 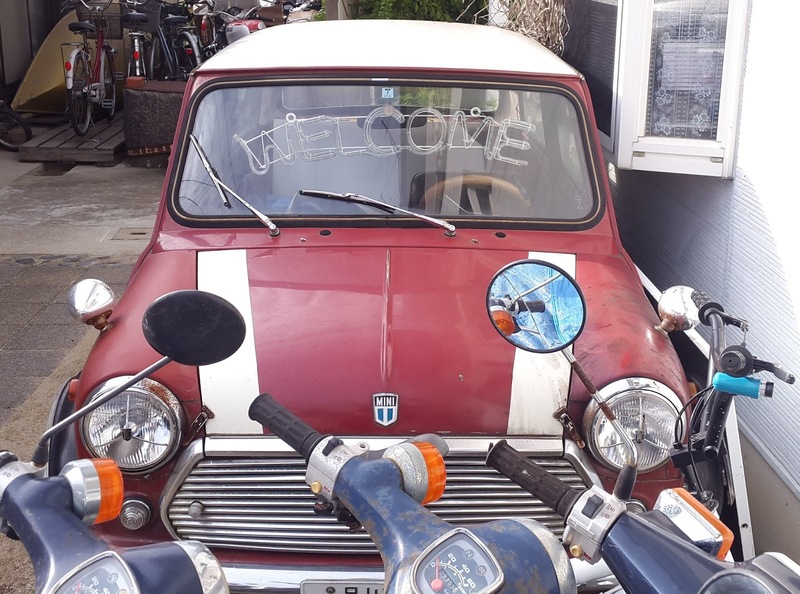 But it wasn't any old common or garden mini cooper, that I do know! As you know, it's the norm to take your shoes off in many indoor places in Japan. However, bare feet while not completely socially unacceptable is not something Japanese people do much outside of their house. Even with shoes that would usually call for bare feet, many women wear some sort of very low socks that almost only cover the sole of the feet. I love watching water so I would have been in my element in that dome. Seriously, how fascinating. The cat with his back to the camera looks the image of my Charlie. I often wondered where he got to... smiles. Such a fascinating and lovely place! It sounds like it would take several days there to see everything, and even then some things might be rushed. By the way, the only cats that live in groups or families or colonies are lions and house cats. Some house cats are total loners, but most will form bonds with other cats in their home or near by if they are given a chance. This museum would have really struck me, what a place!I've never been out of Europe and your Japanese experience sounds so exotic to me.Beautiful photo reportage as well. Another intriguing, interesting post, Jenny. I think I'll stick to my shower and modern baths (not that I have a bath tub in my cabin). I'm not sure I'd feel at ease in that "white" tunnel. It would give me an odd feeling, I think. It appears a little eerie to me...but I could be entirely wrong. ...selfies of themselves with lemons... <-- Now this made me laugh! The domed museum with water puddles on the floor sounds intriguing. Wonder how "zen" it is to have cold, wet socks, though? I did laugh at the idea of having a selfie with a lemon, I wonder if Kim Kardashian has done that yet? So where is yours? When you have taken your shoes off, where do you leave them or do you carry them around with you? I have just read with great pleasure both parts of the Teshima post. Like all good travel writers you make me want to book a trip. The museum made me think a little of Cesar Manriques wonderful house built under the lava flows of Lanzarote. Thank you, Alan. I have seen photos of the Cesar manriques house, and it's definitely one I'd like to see. I once stayed in a house in France built right into the side of a cliff, many of the rooms had rock walls. It was a bit dark though in the hot summers I don't think anyone minded that. The Teshima Art Museum looks more like a place of meditation or contemplation than a museum. Perhaps that's the idea. I'm intrigued that modern Japanese baths actually tell you when they've reached the right temperature! Better than dipping your hand in and getting scalded (or chilled). And I like the neon sign in the car. I could do with a neon sign in the back of my car saying "You're Too Close". I tried to post two previous comments, but kept getting a message saying that the server couldn't be found. This has happened on numerous other blogs, too. The evil Blogger gremlins are working overtime. Thanks for sharing your Teshima excursion - it is really fascinating! I'm not sure if I'd want to try the goeman buro, but I would definitely try the lemon squash. I'm glad you managed to post for the third time, Jon. I THINK that the site is OK now. Just one of those Blogger things. Everything that you have shown here Jenny is so completely different to anything I have ever seen before. Overwhelmingly the impression I have of the Japanese from your photos and descriptions is that they seem to be extremely happy people. There is a lot less of the obvious grouchiness and casual rudeness that seems to be part of life here. This is why we travel. To see how exotic and different we are. Amazing. Interesting post Jenny, not too sure about the water dripping and running on the floor. Have these people never heard of waterproofing and drainage? I was very surprised to know this type of bathtub has an awful story. That lemon yellow phone is a real fancy one. I'm with T when it comes to wet art! wow, how different and interesting! Your posts always make me want to travel more. I love the story of the bath, and holding his infant son above his head. I am a little embarrased to say this, however, when I was a child, I think all baths were like the one in the picture, with burner openings outside of them. I remember sitting on the floating wooden lid to let it sink to the bottom when I soaked in. The picture brought back the memory of it.Once there was an incident that a cat had sneaked into the opening where we put firewood, maybe to warm itself. When my mother was about to start the fire, it rushed out of it. Both were startled. A Cinderella cat? 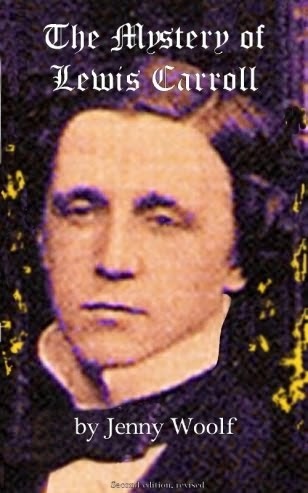 Good old days of mine. Hello, again, Jenny. Nice to know your trip to the island was so exciting. 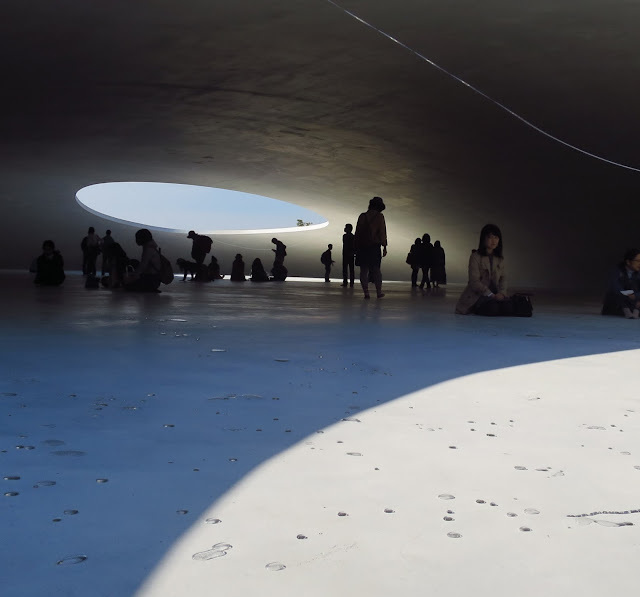 Teshima Art Museum is fascinating and it reminded me of the etymology of “Museum”, “Seat of Muses”. Museum would be a place for visitors to get inspiration from Muses or to look at themselves and world through meditation rather than a structure where fine arts, valuable specimens, or other objects of permanent value are stored and displayed as many people think. As to the video, I guess local high school students are performing Brass Band as part of the culture festival. I believe the climate of Setouchi region is the mildest in Japan as a native of Kobe which is part of that region. It’s the only region olive is cultivated in Japan. I’m sure and hope people can enjoy quality life on those islands if each island can get a chance to overcome depopulation. Hello Yoko. Yes, you are right - "museum" does have another meaning. It isn't one I generally use, but it is perfectly correct. It's highly appropriate for The Teshima Art Museum. The islands mostly seemed beautiful. I know that some parts are heavily industrialised but I hardly saw that. If I lived in Japan I might try to buy a holiday home on one of the islands, and enjoy the uncrowded space, nature and peace. But even so, it would be necessary to have a shop and a ferry service too. What an interesting post. To me, being in Japan, is to truly be in a “foreign” land. When my daughter and I went there I really felt that we were far, far away. I think it gives one a real “depaysement” that is the only word I can think of and I can’t think of it in English. Maybe disorientation, but that’s not really it – just out of your own familiar world. We do need a word for that in English. I know the feeling you mean. Just caught up with both your Teshima posts. Absolutely fascinating as always. The art museum looks wonderfully peaceful, even with all the people there. And wow - the bath! Amazing. Oh, that white art museum looks beautiful to me, and I would love to feel the serenity of it. 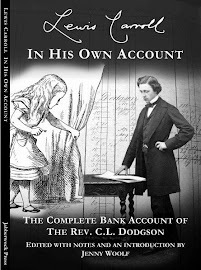 You saw so many curious things Jenny, you must have felt like Alice in Wonderland as you walked around. I loved the cosmos in Japan and that field of pink is very appealing - but then, I'd love a lemon phone too - I just love colour! Interesting. Although I'm not a fan of wet socks either. We have our first airbnb place book for next month. Have you been happy with them?